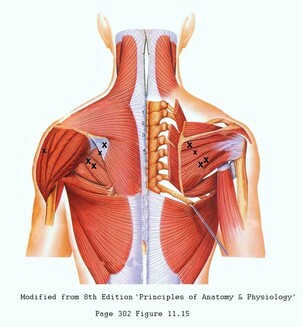 Trigger Point Therapy [illustrated by the image] is the mainstay of productive remedial massage. Although there are many methods of releasing these points within the muscle, my preference is for massage to the points, increased pressure to the points, followed by Dry Needling to the points, with such a protocol demonstrating very successful outcomes! No everyone agrees about Trigger Points, with that being an article in its own right. Nonetheless, the more aware therapists have no doubt about the importance of releasing the Trigger Point(s) in the muscle. For instance, read the snippet below from a Chiropractors webpage. 'The day that I learned about the multifidi trigger points was a revelation for me. As a chiropractor, I had battled the transitory effectiveness of spinal manipulation for years. My patients would complain that the pain relief provided by my chiropractic treatment only lasted for about a half an hour.In frustration, I asked other chiropractors if they had the same experience and they reported the same situation. ​​Of course, most chiropractors use this treatment shortcoming as an excuse for over-scheduling their patients. Seeing patients 3-5 times a week may be good for their pocket book, but there is absolutely no clinical evidence that it’s an effective treatment protocol. I wanted to know what was causing my patient’s articular dysfunctions to return so quickly after my treatment. What I discovered is that trigger points in some of the small intrinsic muscles of the spine were not only causing the articular dysfunctions, but they also produced a “boney” type of spine pain themselves. Releasing the trigger points in these muscles, not only supercharged my chiropractic treatments, but often eliminated the need for any type of spinal manipulation in most cases. After treating many, many cases of spinal pain over the years, I have no doubt that locating and releasing the multifidi trigger points are the key to success. Just don’t try to tell a chiropractor that! - Editors note: Nor a surgeon!